Definition at line 18 of file UserData.h. Definition at line 34 of file UserData.h. Definition at line 23 of file UserData.h. References ACLUserData(), clone(), dump(), empty(), match(), parse(), and supportedFlags(). Definition at line 78 of file UserData.cc. 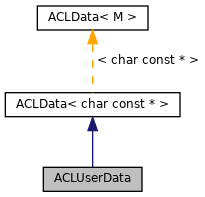 Referenced by clone(), and ~ACLUserData(). Definition at line 149 of file UserData.cc. Definition at line 46 of file UserData.cc. References debugs, flags, JoinContainerToSBuf(), and userDataNames. Definition at line 140 of file UserData.cc. References debugs, flags, and userDataNames. Definition at line 28 of file UserData.cc. References debugs, flags, NULL, and userDataNames. Definition at line 86 of file UserData.cc. References CaseInsensitveSBufCompare(), SBuf::cmp(), DBG_PARSE_NOTE, debugs, flags, NULL, ConfigParser::strtokFile(), SBuf::toLower(), and userDataNames. Definition at line 21 of file UserData.cc. Definition at line 38 of file UserData.h. Referenced by ACLUserData(), dump(), empty(), match(), and parse(). Definition at line 39 of file UserData.h. Definition at line 35 of file UserData.h. Referenced by dump(), empty(), match(), and parse().